One of the pleasures of springtime in Toronto is the opera production from the Glenn Gould School of the Royal Conservatory of Music. This year, it is particularly momentous because for the first time, it is taking place in the spanking new Koerner Hall. Opened since last September, this venue boasts excellent sight lines and superb acoustics. Having heard a number of concerts there already, most recently the Canadian Chopin Competition Winners' Concert, I was eager to hear (and see) an opera production. This year, the GGS Opera is Jules Massenet's Cendrillon. To most opera buffs, when they think of Cinderella, it is usually Rossini's La Cenerentola, with Cendrillon a distant second, a real shame as there's some beautiful music in the Massenet score. Depending on the production, it can be either rollickingly funny or whimsical and touching. It's not performed very often, but quite remarkably, it is being done by both GGS-RCM as well as Opera de Montreal within a couple of months this spring! The last time I saw this piece was a screamingly funny Paris Opera production by Laurent Pelly. It was one of the more memorable nights in the theatre in recent years. GGS operas are sung by advanced students earmarked for professional careers, and each year there are new voices to discover. Last year's Cosi, for example, featured two excellent sisters - Inga Fillipova-Williams as Fiordiligi and Wallis Giunta as Dorabella. I attended today's show expecting some fine singing and I was not disappointed. The principal roles are all double-cast. Today's performance was the "first cast" with a bunch of fresh, appealing voices. 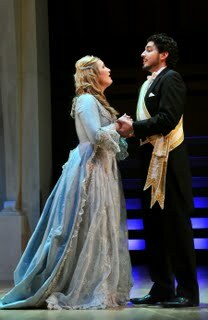 Top vocal honours today went to soprano Meghan Lindsay as Cendrillon, a role usually sung by a mezzo. She has lovely stage presence and sang with silvery tone, with an exquisite mezza voce. Partnering her was tenor Michael Ciufo. Darkly handsome and singing with bright sound, excellent French and ingratiating tone save for a few tight top notes, Ciufo was a fine Prince Charming, a role sometimes also taken by a mezzo. The big Act 3 duet between Lindsay and Ciufo was the highlight of the opera. As Madame de la Haltiere, Ramona Carmelly had the right comic flair and rich tone. Baritone Maciej Bujnowicz looked a bit too young to be the father, but he was an unusually sympathetic Pandolfe. Also noteworthy was the crystalline, soubrette tones of Joelle Tan as the Fairy Godmother - this fairy had no magic wand but held a crystal globe in her palm! The supporting roles were all cast from strength. I begin this week's post with a piece of sad news for opera fans. 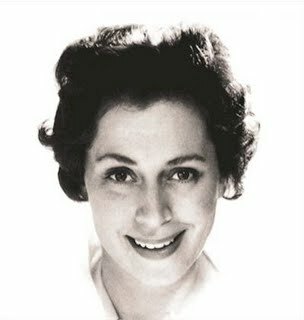 The beloved Swedish soprano Elizabeth Soderstrom passed away from complications of a stroke at the age of 82. She made her debut in 1947, singing mainly light lyric and soubrette roles - she was a marvelous Susanna in her early days. She sang at the Met in the early 60's, but later restricted her appearances closer to her home in Sweden to raise a family. She reappeared on the international scene in the 1970's until her retirement in the late 1980's. A frequent visitor to Toronto, I have many fond memories of her performing here - a concert Tatiana that also featured Nicolai Gedda as Lensky in Massey Hall; Hanna Glawari for the COC; several Rachmaninoff songs recitals. But my most memorable experience of her was as the Marschallin, opposite the Octavian of Frederica von Stade and the Sophie of Kathleen Battle with the Met on tour in Cleveland. She remains my favourite Marschallin to this day. I also remember a late-career Nozze di Figaro Contessa at the Met around 1987. By that time she was past her best vocally but remained a supreme artist. Now to happier news. The Toronto Symphony Orchestra presents Shostakovich's monumental Symphony No. 5 on Nov. 25 at a rather odd time of 6:30 pm at Roy Thomson Hall. Stephane Deneve leads the TSO forces. On Nov. 26 2 pm, 28 at 8 pm and 29 at 3 pm, the great Canadian violinist James Ehnes plays the Prokofiev violin concerto No. 2, in addition to the Shostakovich symphony and the Prokofiev Suite to Love For Three Oranges, with Deneve on the podium. The Aradia Ensemble under Irish conductor kevin Mallon presents a interesting concert to commemorate the 200th anniversary of the death of Haydn, on Nov. 27, 8 pm at the Glenn Gould Studio. On the program is Mallon's reconstruction of mass fragment Missa Sunt Bona Mixta Malis. It is billed as a world premiere. The centerpiece is Haydn's Lord Nelson Mass, with a quartet of soloists led by soprano Charlotte Corwin. Three Czech Dances for Two Pianos. It takes place on Wednesday, November 25, 2009, 12:00 pm and > Thursday, November 26, 2009 at 8:00 pm, at the venerable Mazzoleni Hall of the RCM. The National Ballet of Canada follows an ultra-traditional Sleeping Beauty with a cutting-edge contemporary mixed program, Nov. 25 - 29 at the Four Seasons Centre. On the program is choreographer Aszure Barton's world premiere, Watch Her. This is paired with George Ballanchine's scintillating The Four Temperaments, set to a score by Paul Hindemith. 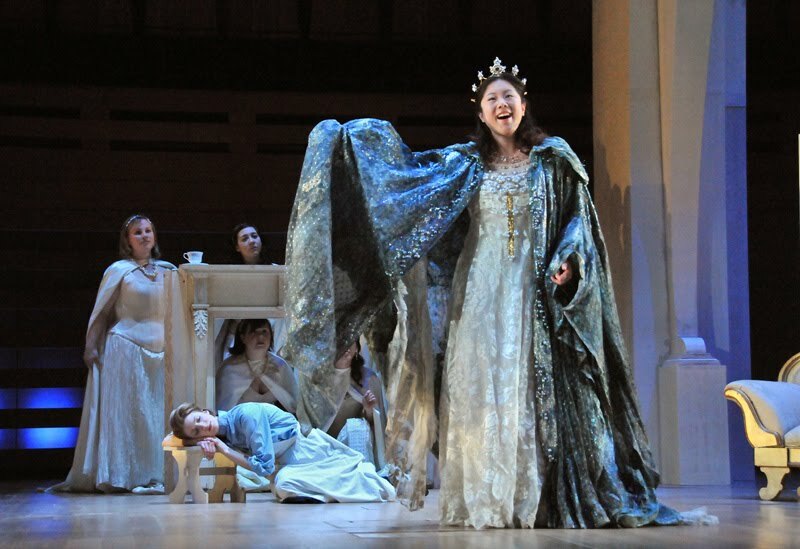 April is opera month in Southern Ontario, with a veritable treasure trove of productions from mainline companies like the COC, Opera Atelier, and Opera Hamilton. But we mustn't forget the venerable Glenn Gould School of the Royal Conservatory of Music, whose shows are invariably enjoyable and give us a chance to discover voices of the future. This is particularly true this spring as I attended the opening night of a semi-staged Cosi fan tutte on Thursday April 2. It was so good that I went back a second time yesterday afternoon. As this production of Cosi clearly demonstrates, there is a wealth of vocal talent in Canada. Rarely has Cosi been as genuinely funny as this one. At the risk of sounding ageist, I have to say the roles in this opera are best taken on by singing actors at the bloom of youth, when it comes to dramatic verisimilitude. 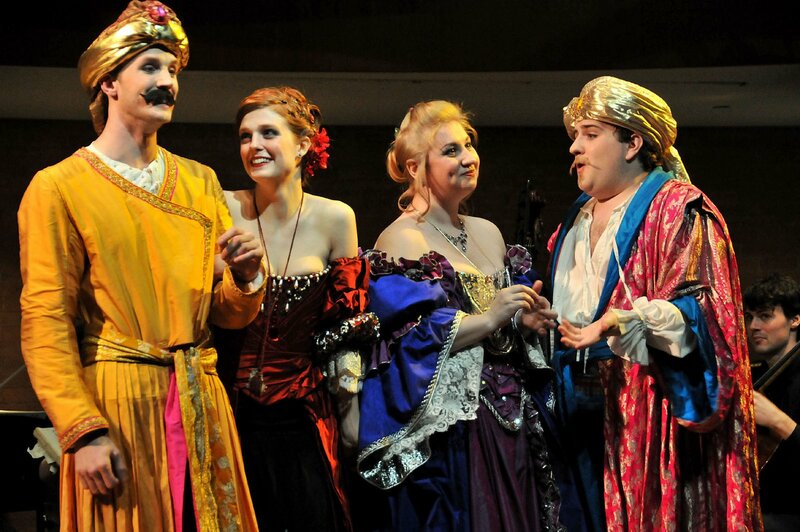 In this production, there are eleven soloists altogether, all double-cast except for Don Alfonso. The six soloists in the first cast that I saw are certainly up to the task - I think all of them are young artists in the Glenn Gould School Artist Diploma program. They are well schooled, throughly prepared and expertly directed by Jennifer Parr. Heading the cast was soprano Inga Filippova-Williams as Fiordiligi. She was a finalist in the Julian Gayarre Singing Competition last September. Her beautiful and flexible full lyric voice, even from top to bottom, is tailor made for this most exacting of Mozart heroines. On both April 2 and 5, she sang a fiery "Come scoglio" with excellent floritura and huge high Cs. She was also able to scale down her big voice for the even longer, fiendishly difficult "Per pieta", touchingly sung and only a little short on a truly solid trill and totally clean scale work. She also used her expressive face to comic effect. Filippova-Williams was well matched by the Dorabella of Wallis Giunta, who has been given several high profile assignments including the title role of Dean Burry's Pandora's Locker at the RCM. Blessed with glamorous looks, a gleaming high mezzo and good dramatic instincts, Giunta's Dorabella was an unalloyed pleasure. 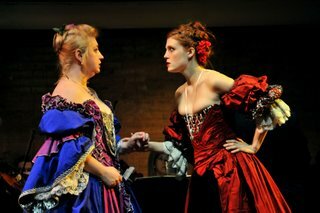 Soprano Taylor Strande was a bright-voiced, spunky Despina, her soubrette a nice complement to the two ladies. The men in this production are also on a high level. Montreal native and McGill graduate lyric baritone Matthew Cassils was an engaging Guglielmo, singing with firm, attractive tone. Ferrando, his partner in crime, was sung by tenor Adam Bishop with a sweet lyric sound, ideal in the lighter Mozart roles. His "Un aura amorosa" was well sung, even if his top notes were produced with some pressure. He also acted very well - arguably the funniest guy onstage! Bass-baritone David English brought equally vivid sense of drama to his role of Don Alfonso, using his imposing height to advantage. I'd be remiss if I don't mention the excellent stage direction of Jennifer Parr. Given the small size of the stage already occupied by the orchestra (there is no pit), space is at a premium. Parr shows impressive creativity in using the minimal space onstage as efficiently as possible - it is amazing what one can do with two modest-sized benches! She also uses the aisles and doors in the auditorium for entries and exits for the chorus and principals. On both April 4 and 5, the performance was anchored by the marvelous conducting of Mario Bernardi, once again showing to all that at the grand age of 78, he is still a fabulous Mozartian. He was very supportive of the singers and covered for them when there was an occasional slip-up. The youthful orchestral musicians played their hearts out, and the performance as a whole, while not note-perfect, was of a very high level indeed. There is one last performance tomorrow (Tuesday April 7th at 1 pm) with the second cast which I have not heard but is reported to be fine. The location is Mazzoleni Hall, Royal Conservatory of Music, 273 Bloor Street West in downtown Toronto. Remember - due to limited seats, it would be wise to get there at least 45 minutes early to secure a voucher.